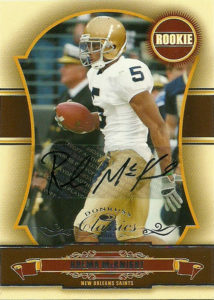 Rhema McKnight ranks among the top receivers in Notre Dame history playing there from 2002-2006. A rare 5th year Senior, McKnight posted almost identical lines in 2003 (47 receptions, 600 yards, 3 TDs) and 2004 (42 receptions for 610 yards, 3 TDs), before a devastating knee injury wrecked his 2005 campaign. Rhema returned in 2006 and posted his best year ever, with 67 catches for 907 yards and 15 touchdowns. His 170 career receptions and 22 TD career catches ranked second in school history at the time of his graduation. Rhema was not selected in the 2006 NFL Draft. He signed as a free agent with the New Orleans Saints and then later was briefly on the roster of the San Diego Chargers. As of 2015, McKnight remains busy working for a construction company in California, and runs the Rhema McKnight Football Camp. I pulled this autograph from a grab bag at Kenny’s Card Shop- a local quiet, card filled institution of collectible and sports memorabilia. Not a big fan of this card design. I feel as though it is cluttered with over elaborate design, all to justify the ‘classic’ label, with the gold foil type getting lost in the maroon ribbon.